What’s so important about these elements is that while each one contributes to the story, it is the YBR that connects them all. Indeed, it is the experiences of the characters as they travel along the YBR that is the story. So it is with blended learning. Like the YBR, the learning journey IS the story. As a learning and development professional, you have some experience working with various sorts of instructional strategies, techniques, and technologies to address particular organizational needs. If you’re a developer, you might excel at creating one or more types of digital learning. Perhaps you have a talent for creating storyboards, or designing infographics, or scripting videos. You might be a virtual facilitator who excels at engaging your audience without the benefit of eye contact and body language. Whatever your vocation, you recognize the role of the elements of the training being delivered, but it is safe to say that many of your learners may not. Often, they treat each element as an end unto itself. We’ve actually taught them to do that by introducing each element (live lessons, self-directed activities) as individual items, not as part of an integrated whole. In reality, they are both. Enter the Yellow Brick Road. Without a sense of the overall narrative, an adult learner is far more likely to leave a program or skip some elements because the benefit of completing the program is not clear. Instead, if they have a road map showing the entire trip rather than just the next milestone, they are far more likely to continue down the road to completion. So what’s a concerned training professional to do? If I could provide just two bits of advice to any blended program designer or implementation team, it would be always have a narrative and always tell the learner what that narrative is. Decide what narrative we are trying to tell, and how all the pieces of the training program fit together to support that narrative. As a matter of practice, the narrative is related to, but distinct from, the design document. In contrast to those formal design elements, the narrative aligns the intent of the learner and that of the organization. It lays out the relationship of the learning experience to the desired outcome and allows the learner to internalize that outcome as their own. A simple visualization of the narrative might be a course map, with annotation informing the learner why each stop along that experience is important. Clearly articulate the narrative (and the instructional design supporting it) in a way that is compelling to our learners, and reinforce that narrative frequently. This is where many practitioners fall down. Instructional designers may well have a fully formed narrative that informs the design for a blended learning campaign, but then seem to want to play some kind of inferential “I’ve got a secret” with the learner by not explicitly telling the learner the purpose of the entire effort. It’s almost as if the designer is challenging the learner to intuit the narrative from its elements. 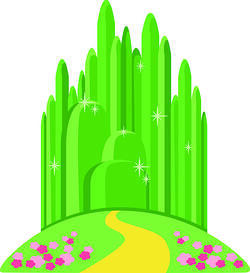 (Think again about the elements of the Wizard of Oz – could you have told that story simply by reading the list of elements?) The telltale of this kind of behavior is a syllabus or course outline provided to the learner that is simply a list of objectives and elements, as if to say “I am Designer. Behold this list of objectives and things to do, and assume it is important!” (apologies to Ozymandias). These two bits of advice are even more important as the length or complexity of a blended solution increases. Learners need to be able to apply each new learning experience to the overall journey – something that might be easy to forget over several weeks or months. We first explored this approach with Laura Goodrich, Global Workforce Innovator at GWT Next. During her Modern Learning On The Air podcast, she shared the concept of ‘cinematic microlearning,' which combines storytelling and short bursts of learning to improve communication and transform learning experiences. Research shows that we naturally make better connections when listening to stories and that short bursts of learning help us better retain information. The narrative helps the learner make sense of why they are going from Point A to Point B to Point C. It provides them with the rationale for participating, allows alignment of learner intent with that of the program, and promotes learner engagement with each element of the program because they understand its contribution to their individual development. In addition, an effective narrative enhances learner perception of relevance and usefulness, thereby increasing completion. Design with the narrative in mind. The narrative is clearly reflected in the design of the blended solution. Your ‘learning campaign’ becomes the narrative. Share the narrative. The narrative is explicitly and meaningfully articulated to the learner – e.g. a campaign map that provides a visual illustration of the journey, and what to do at the stops along the way. Let each element of your narrative play its own unique role. Different elements of the blend often have typical roles in the narrative - microlearning highlights key points (signposts), activities provide practice or real-world application, job aids help to solve problems, videos provide a situation or challenge the learner can relate to, etc. Curate every element. Curation of a blended learning experience provides the momentum to the learner to continue down the road by reinforcing the narrative and keeping it relevant to the learner’s perceived needs. As part of curation, identify the moment of learning need that each element supports. The facilitator is the narrator, not the star. Learners are the protagonists in your narrative. From their individual perspectives, every learner is central to their own learning story, and our job is to tell the story in a way that compels them to complete the trip. Ready to incorporate narrative into your training programs? 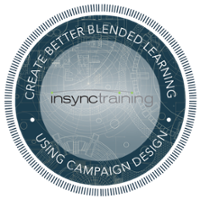 Join InSync’s Create Better Blended Learning Using Using Campaign Design Workshop for more detail and specific best practices in blended learning for the modern workforce. We’ll not only talk about why the YBR is important, we’ll put a yellow brick and trowel in your hands and help you to start building your journey.